Your home’s drywall is typically only a half-inch thick and made of soft materials such as gypsum and paper. They make sturdy walls but can be easily dented or be too weak to hang things from such as a floating shelf. For this reason, you need drywall anchors to hang items on the wall. If you have a stud finder and can locate a stud, you may be able to hammer away without the need of a drywall anchor. Otherwise, you need to pick the right type of drywall anchor by weighing the item you want to hang. If you don’t use the right one, the anchor may eventually pull away from the wall due to overloading. A toggle bolt is the type of drywall anchor that you will want to buy when you need to hang very heavy items. If you are going to be hanging up shelves that will hold a lot of weight, then you will need to have good bolts that can secure them properly. There are some toggle bolt drywall anchors on the market that can hold as much as 300 pounds of weight. You may even encounter toggle bolts with higher limits than this, but it will really depend on the bolt itself. At the very least, most heavy duty toggle bolts will have a 100-pound weight capacity. These drywall anchors are designed to be heavy duty and are specifically meant for hanging heavier items. You just want to make sure that you take the time to pick out the right toggle bolt. You don’t want to try to hang something that is going to bear several hundred pounds of weight with a 100-pound capacity toggle bolt. As long as you pay attention to what you are purchasing and you understand your needs properly, everything should go just fine. These drywall anchors are a little bit different than the other ones that appear on this list, though. Aside from being a drywall anchor that is meant for hanging larger items, the design of this anchor is different from everything else. It doesn’t act as a casing like most drywall anchors, but you do place the screw through the hole and then drive it in. The anchor will become embedded in the wall and this effectively secures the screw in place. This is the sturdiest type of drywall anchor that you can purchase. It shouldn’t be too difficult for you to make use of it and it is going to be really useful when you have heavy items to hang. You need to be able to do everything properly, so it’s a good idea to get the right drywall anchor for the job. The toggle bolt that is being showcased is only rated for lower amounts of weight, so they are better at hanging smaller items. You will be able to find toggle bolts with higher capacities so long as you look. This toggle bolt drywall anchor is no slouch, though. When you need to hang shelves that are only going to bear normal amounts of weight, these are going to work swimmingly. They aren’t overly expensive either, so it’s a good set of toggle bolts to purchase if you need to hang multiple items. Twenty-five different toggle bolt drywall anchors are included in this package. There are several different sizes and some of them will be better at bearing larger amounts of weight than others. Use the toggle bolt drywall anchors accordingly and you will surely have a good experience. Strap toggle drywall anchors have several similarities to the toggle bolt drywall anchors mentioned above. These drywall anchors are also considered to be the strongest options available. The idea behind using these strap toggles is the same as using the toggle bolts. The way that you go about things is just different. When you go to make use of a strap toggle, you will be attaching the strap to the toggle and then using it to anchor it to the wall. There are a few advantages to using a strap toggle instead of a typical toggle bolt drywall anchor. In order to make use of a toggle bolt drywall anchor, you will need to drill a fairly sizable hole. Using a strap toggle drywall anchor allows you to accomplish the same thing while only making a small hole. You can simply anchor the toggle up against the wall with your strap and then get your screw ready. Once you have everything into position, you will be able to fasten it into the wall and you will be ready to finish up. It’s a relatively simple method that sounds more complicated than it really is. You’ll be able to make use of a strap toggle drywall anchor quite easily and will be able to hang heavy items without too much of a hassle. One important reason to make use of strap toggle drywall anchors when you can is simply to avoid making large holes. People who are renting homes or are living in apartments often want to avoid making holes in the wall. This can sometimes negatively impact their deposit and they will have to fix these issues before moving out. Making only a small hole is less noticeable and will be easier to cover up in the future if the need arises. Aside from this, many people just find the strap toggle drywall anchors to be more convenient. They are easy to use overall and will make hanging items a breeze. Depending on the size of the strap toggle drywall anchor that you have purchased, you will be able to hang pretty heavy things. Some of the strap toggle drywall anchors will have very high weight capacities, making them a very desirable option. This product here contains six toggle straps with the necessary screws to get the job done. It’s a very affordable purchase to make and will work excellently to hang your items. If you want to hang something as securely as possible, then using either a toggle bolt or a strap toggle is highly recommended. The other options will work well for certain purposes, but these are the two options that are the most heavy duty. Steel hollow-wall anchors are also referred to as molly bolts in some circles. No matter what you want to call them, these drywall anchors are going to be effective tools for fastening various items to your walls. These drywall anchors are characterized as anchors that look like a metal casing for a screw to fit inside. That is essentially what this drywall anchor is, and it works very well at what it is designed to do. Once you start driving this steel hollow-wall anchor into the drywall, the metal casing will begin to expand. This helps to make an anchor inside of your drywall and it allows your screw to become secure. It’s an effective method for hanging something and making sure that it won’t come loose. This drywall anchor is among the strongest types that you can purchase on the market. You can use this convenient drywall anchor to help you hang items that weigh up to 100 pounds. This is a lot of weight and should be good to help hang many different items. Some popular items that are often hung with steel hollow-wall anchors are large towel racks and coat hangers. You will be able to hang art that weighs a bit more than usual using this type of drywall anchor, too. These drywall anchors are exceedingly simple to use. As is typical with drywall anchors, you will need to pre-drill a hole for yourself before starting. Insert your anchor and use your hammer to set it up just right. Once you have everything lined up, you will be able to drill it into the wall. You can either use a power drill or a traditional manual screwdriver to tighten this screw. You want the screw to be very tight, so use whichever method is the most comfortable for you. As the screw continues to be driven into the wall, the anchor itself will expand. Everything should be very secure once you have tightened the screw completely, so you can feel confident so long as you are hanging something that is under 100 pounds. The steel hollow-wall anchors that are being shown right here are good for multiple purposes, too. You should actually be able to use these anchors for plaster walls and even in tile. This is very convenient because you won’t have to buy different anchors when you have something that you need to hang in your bathroom or another room that makes use of tile on the walls. You’ll still need to pay attention to the weight limits, but it should work out very nicely. 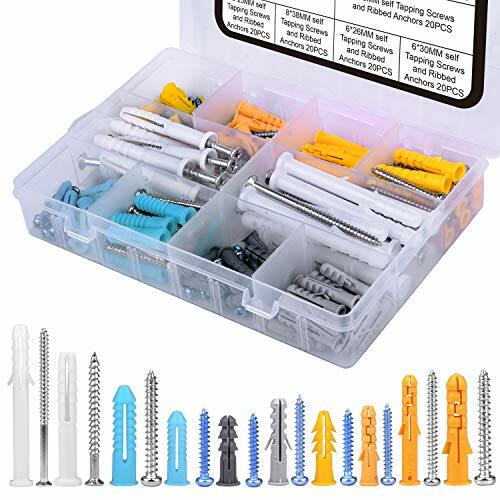 This kit comes with 42 different pieces of drywall anchors and screws. There are even several different sizes that you will be able to take advantage of. Six different sizes of drywall anchors are included and some of them will be better for hanging heavier items. It’s a convenient pack to purchase when you have multiple things to hang on your walls. Self-drilling anchors are among the most convenient types of drywall anchors that you can purchase. These are incredibly simple to use and you shouldn’t have any trouble securing something to the wall when you have them at the ready. One of the distinguishing features of a self-drilling drywall anchor is that it sort of looks like a small screw itself. There is a thread on the anchor itself that will make drilling it into the wall with the screw quite simple. When you are using most types of drywall anchors, you will be required to drill a hole ahead of time for the screw to go into. This isn’t the case with these self-drilling anchors. You can put them right into the wall and it will be a very easy process. There is a lot of conveniences to be able to hang something with one of these anchors, and that makes them a very popular option. It should be noted that the usefulness of these self-drilling screws will have limits. The way that they are designed will allow them to help you hang items that are up to 50 pounds. This means that hanging curtain rods and even certain shelves will be possible. Very heavy items will be a bit too much for these drywall anchors and you will need to try to use something a bit more heavy duty. Even so, these drywall anchors are among the easiest to use and are popular because of it. People use these types of drywall anchors very frequently. You will likely find that the 50-pound weight limit of these drywall anchors is pretty generous. You might not have too many items in your home that you would need to secure to the wall that will weigh more than 50 pounds. It is recommended that you avoid using these to try to mount televisions to your wall. Even if the television is around the 50-pound weight limit, it may not be the best idea. A television is an expensive piece of equipment and you are going to want to buy a heavy-duty screw to ensure that it stays safe. Always be careful with your choices when you are hanging items that are on the heavy side. This particular set of self-drilling anchors is an affordable option for you to look at. It comes with four self-drilling anchors and it includes the screws that you will need to use them properly. You can easily secure the screws to the wall using a simple Phillips head screwdriver. These screws will even drive in properly if you happen to hit a wood stud, so you know that this is a high-quality product. The cost-effective nature of these self-drilling drywall anchors is going to be very agreeable to you. It would be very easy to purchase several of these self-drilling anchors. If you have multiple things to hang and want it to go as easily as possible, you should definitely purchase some of these. They will be useful and you’ll have an easy time using them. Plastic expansion anchors are probably the most common type of drywall anchor that people make use of. They’re very affordable options that allow people to hang light items effectively. If you have a picture that you want to hang or another item that you want to put on the wall that is lightweight, then this should work nicely. You should just make sure that the item doesn’t weigh more than 15 pounds if you want everything to go as smoothly as possible. These plastic expansion anchors are not meant for hanging heavy items. When you try to hang heavy items with the help of these drywall anchors, you will encounter problems eventually. Even if it looks like everything is going to be fine at first, you may wind up discovering that your screw is coming out of the wall. This can be problematic and could even cause you to damage your frame or other types of items that you hung on the wall. To avoid this, simply make sure that you are using the right drywall anchors for the right purposes. If you use the proper anchor, then you are going to have a much better experience overall. It will keep your items safe and everything is going to look the best that it possibly can. For the most part, these drywall anchors are going to be affordable no matter what, so it is always going to be best to use the right type of anchor for your needs. This plastic expansion anchor is going to come in handy for hanging many lightweight items. The plastic expansion anchor is going to hold a screw inside of it. This screw will be able to be driven into the wall effectively and the anchor will expand around it as it is driven in. Installing a screw using one of these plastic expansion anchors is actually really easy. You just need to drill a tiny hole to start everything off. Once your hole is ready, you can tap the anchor into the wall a bit with a hammer. Once that is set, you should place the screw inside of the plastic expansion anchor. Screw everything into place using a drill and you will be good to go. The set of plastic expansion anchors that is being shown here is actually a convenient multipack. It comes with 200 pieces and includes plastic expansion anchors and screws. You will find that screws come with plastic expansion anchors quite frequently. This is convenient as you will always know that you have the right size to use along with your anchor. There is a storage case that comes with this pack as well. This makes keeping all of your plastic expansion anchors organized a lot easier than it might be otherwise. You will be getting a great deal if you decide to purchase this pack. It will definitely be useful for hanging many small items, so it’s a good buy. Plastic is definitely one of the most common materials used in drywall anchors. The plastic expansion anchor is very prevalent and is what most people use to hang pictures. The plastic is actually fairly durable and should work pretty well as an anchor. It isn’t powerful or rugged enough to handle too much weight, though. The weight limits on plastic drywall anchors are going to be a lot lower than options that use sturdier materials. 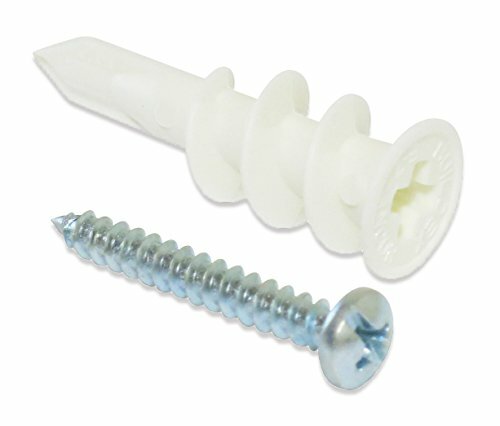 Plastic drywall anchors are very affordable though, which makes up for the lack of weight capacity. You will be able to buy several plastic drywall anchors at very low prices. They often come in packs where dozens of them are included for a small sum of money. The set being showcased here is a convenient set of ribbed plastic drywall anchors. There are also several different drill bits included that will make the installation process easy. You’ll be able to use this set to hang some of your smaller items very nicely. It is a cost-effective way to hang up pictures and other small items. Steel is another material that is commonly used to make drywall anchors. Most of the sturdier drywall anchors are going to be made out of steel. Even the strongest drywall anchor options, such as toggle bolts, are made from this durable metal. It will create an anchor in your drywall that will hold nicely, allowing you to hang heavier items without having to worry. When you need to hang something that is a little bit on the heavy side, it is smart to buy a steel drywall anchor. There are several types, including the steel hollow-wall anchors that are popularly used, so you won’t have trouble finding what you need. It’s always best to buy the right tool for the job. When you want to make sure that you are hanging things safely, get a steel drywall anchor. This steel drywall anchor is one of the hollow-wall anchors that is mentioned above. This model is a bit different than the other product. It features 40 pieces that will definitely come in handy when you’re hanging shelves. It comes with a nice plastic case that has six compartments for organizing your anchors as well. Zinc is regularly used in the plating on certain types of drywall anchors. This material helps the drywall anchors to remain as durable as possible and can help to protect it from harm. You will find that zinc is used in many different types of drywall anchors. Not all drywall anchors will have zinc plating, but those that do, enjoy some increased ruggedness. There are some drywall anchors that are made entirely out of zinc as well. They aren’t quite as common as steel drywall anchors, but they can be sturdy in their own right. Zinc is a durable enough material to make for a very good anchor. A drywall anchor that is made of zinc should be able to work well for many different purposes. This product here is one of the drywall anchors that is made out of zinc. It has a shark-tooth design that makes driving it into the wall as simple as it can possibly be. It is a self-drilling model that makes the process of hanging something even quicker than usual. If you want to have a drywall anchor that is easy to use and durable, then this is going to be a very secure option.